Banff Academy have teamed up with Aberdeen University to examine the benefits of studying towards the Scots Language Award. From left, Libby Wilson, the university's Claire Needler, poet and novelist Matthew Fitt, Humanities teacher Dr Jamie Fairbairn, Emma Twatt, Richie Duncan, Jaymi Sivewright and Ellie Narron. Picture by Kath Flannery. Pupils in an Aberdeenshire school are being taught Scots to make them fit like for purpose. Banff Academy has teamed up with academics from Aberdeen University to investigate whether the language has a positive impact on learning. The youngsters taking part in the study will complete the Scots Language Award, a national qualification that provides the opportunity to study the history and development of the Scots language. And organisers hope the course will help pupils excel across the curriculum. Project leader, Claire Needler, is researching contemporary use of Scots, particularly amongst young people, to see how, where and when it is employed in daily life. She said: “I am particularly interested in how speaking Scots can contribute to a sense of place, belonging and community. “More than 50% of people in Aberdeenshire identify as Scots or Doric speakers, with even higher numbers in our northern coastal communities. “Working in partnership with pupils from Banff Academy has shown me that Scots is very much a living language that is used every day. “It can provide a real boost in confidence which reaps rewards not only in this area but right across the curriculum. 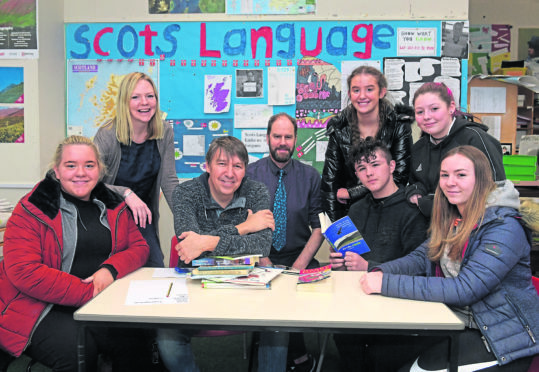 Humanities teacher Jamie Fairbairn explained that a significant number of pupils engaged with the expressive dialect during the course which has been taught since 2014. He said: “Many of our students come from Doric speaking families and have grown up using the Scots language. However, many have never had an opportunity to write in it or to use it in a more academic way. “For some, it has had a quite transformative effect. Students will complete the course as normal but the feedback will be assessed across a wider spectrum. Councillor and chairwoman of Aberdeenshire Council’s Education and Children’s Services Committee, Gillian Owen, backs the new venture.